Rachel Von | The Journal Gazette The Mad Ants’ DeQuan Jones goes up for two of his game-high 42 points during the third quart Monday against Wisconsin. How on fire has DeQuan Jones been for the Mad Ants? With 42 points tonight – the fourth highest total in Mad Ants history – he is averaging a mere 28.5 points over his last 11 games. That’s not including the victory over Delaware in which he was ejected for an altercation less than nine minutes into. 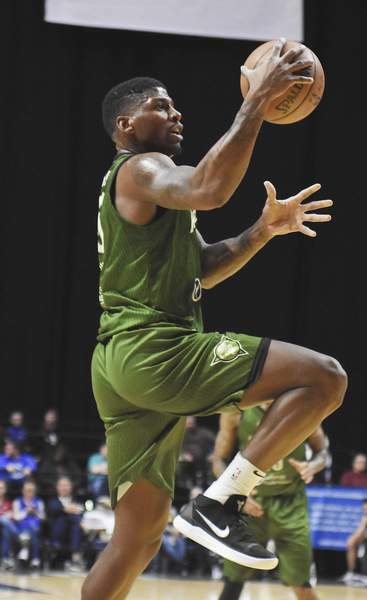 What’s most interesting about his performance tonight, in a 121-107 victory over the Wisconsin Herd, is that the Mad Ants seem to have again figured out how to get Jones and Walt Lemon Jr. producing offensively at the same time. Lemon had 20 points and 12 assists. In Lemon’s first two games back from the NBA’s New Orleans Pelicans, he scored 15 and 19 points and Jones had 8 and 23. Of course, there are always more factors than that just chemistry, such as fouls and match-ups, but I sensed there was something amiss before tonight, though no one was talking about it to me. Before Lemon went to the NBA, he was clearly the focal point of the offense. When he was gone, Jones was the man. That's not so easily rectified when they'd back on the same court, in my opinion. To amplify the matter, you could argue that both players at different points have been the best offensive players in the entire league. The Mad Ants don’t need one to be the sole go-to guy, but they do need both of them to be in the flow of the offense. That seemed to happen for at least a half tonight. The Mad Ants have two more games in the regular season to get this sorted out. They need one more victory, or a Grand Rapids loss, to clinch the Central Division title. If they get that and stay ahead of Erie, then they get the second seed for the conference playoffs. But the division title would guarantee them a home playoff game either way.